If you are planning to have a full wedding that includes bridesmaids and groomsmen it could run you a great deal of money to cover your gown as well as the other women and men’s clothing as well. Bridesmaid’s dresses get more and more costly with every extra woman in the wedding party. When you are deciding how much money you can afford to spend on the wedding clothes, you have to consider the fittings and the flowers or accessories as well. If you can, you might do better to allow for casual wear for the bridesmaids so that they can wear less expensive dresses or skirts. This is particularly good if you are planning an outdoor or beach wedding. The less formal the ceremony, the less money that you are required to spend. Perhaps that is why outdoor ceremonies are getting more and more popular these days. You can also save money on the ladies dresses by purchasing them off season from a bridal store. You can always shop for out of season or discontinued dresses as a means of getting great discounts on gorgeous dresses. If you really want to, you can ask that your bridesmaids forget about the wedding shower gifts in favor of buying their dresses. That is a common compromise that is made these days. If the cost of the dresses is really going to be a matter of stress for you, just reduce the bridesmaids to just having a maid/matron of honor and a best man only for the groom. Many couples opt to forego the extras all together and simply do not have anyone standing up with them at all. After all, there is no law that states that you have to have a maid of honor or best man present during the ceremony. When it comes to the tuxedos for the male participants and the groom, you can often find good deals when renting if you just shop around. It helps is you limit the number of participants if you must in order to reduce costs or if the men involved have their own tuxedos already. Either way, research and comparison shopping really is the best chance. You can also choose to rent the ladies gowns as well as the tuxedos. Not everyone wants to spend hundreds of dollars on a dress that they will wear once. Or spend that much money on many dresses that you will never be worn more than once. Many bridal shops will let you rent a dress rather than buy one. The only difference with rented dresses is that you have to take it as is. They are not custom fitted to you. Other than that, you can save hundreds of dollars doing this. Wearing your mother or grandmother’s wedding dress is also an option; especially if your are choosing a period theme where the dress was used. For example, if you are wearing your grandmother’s dress and the dress was worn in the 40′s, you can make the 40′s your wedding theme. If the dress is your mother’s from the 60′s or 70′s, you can do the same thing. It will save you money and provides you with a fun theme. You can also opt to make your own dress from scratch. Many women are choosing to go with home made pieces because they can get truly original in the make of the dress and the style. It can be made in any fashion that you like and of any material also. Making your own dress is a good way to save money and it is also guaranteed to make sure that no one else has the same style as you. When you make it yourself, you are guaranteed a custom fit without paying a custom price. Finally, you can save bundles on your whole wedding party clothing, including the wedding dress by dressing according to your theme. For example, if you choose a Hawaiian theme, you can wear island clothes. As part of your theme, you can dress in costumes to make the festivities more fun and as an added bonus; you can make the guests and wedding party dress in costume too. You can also get a good deal by buying your wedding items at vintage or used stores. 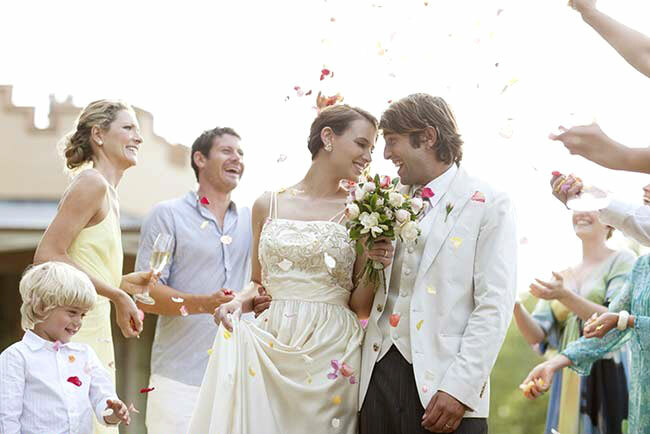 Many people bring back their wedding clothing after they have used so that they can recoup some of their money later. This is a great way to save money for you and the rest of your wedding party. Used clothing items can also be found in bridal shops or tuxedo warehouses because the average person doesn’t wear these items more than once and because of this they will return it to the store that they got it from later. When you are not afraid of vintage clothing, you can find some truly beautiful designer clothing for great prices. Some of the stores that offer used items will not force you to buy them, but they may request that you pay a bit of an extra fee for dry cleaning etc. Either way, you will still be saving yourself a great deal of money that you would spend if you bought your items outright. Mia LaCron is the founder of Cut-Wedding-Costs.info – http://www.cut-wedding-costs.info – devoted to helping individuals live out the wedding of their dreams on a realistic budget they can afford.